A high peak south-east of Garibaldi Lake, Sphinx sits at the head of the Sphinx Glacier. This glacier has two parallel lobed tongues which descend to Sphinx Bay. Seen from the bay these lobes appear to form the paws of the Sphinx while the summit resembles the head of the mythical beast. 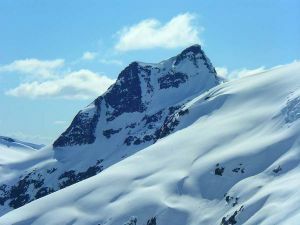 Sphinx is a multi-day trip for most, offering a good chance to explore some of the wilder parts of Garibaldi in the summer or a ski ascent from Sphinx Hut in winter. However, The Sphinx has been daytripped from the Rubble Creek parking lot.